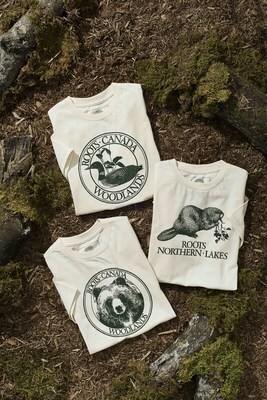 TORONTO, April 4, 2019 /CNW/ - Roots ("Roots," "Roots Canada") (TSX: ROOT), a premium outdoor lifestyle brand, is celebrating International Beaver Day, April 7, launching a limited edition t-shirt collection with 100 per cent of the Canadian profits being donated to the Nature Conservancy of Canada ("NCC"). Honouring Canada's most emblematic animal and Roots beloved logo, the Cooper Beaver as well as other iconic Canadian wildlife, the collection features archival artwork from Canadian design trailblazer, Heather Cooper. International Beaver Day recognizes the important role that beavers play in the Canadian ecosystems. Beaver ponds provide habitat for wildlife, improve water quality and can help to reduce the impacts of climate change. Once near extinction, the beaver is now one of Canada's most triumphant conservation success stories due to the introduction of laws to conserve wildlife and the establishment of Canada's first protected areas, such as Algonquin Provincial Park, the birthplace of Roots. "As our logo for more than 45 years, the beaver plays an integral role in the Roots brand story," said Karen Zuccala, VP Marketing, Roots. "The beaver is emblematic of qualities we admire, most importantly being community builders. We continue to work to do our part to make our communities a better place, and we are excited to partner with NCC on this initiative. When seeking inspiration for the collection, we looked no further than one of the artists behind our logo, Heather Cooper." Designed and made in Canada, the collection features images of a beaver, grizzly bear and common loon, originally created for Roots by Cooper in the 1980s. Starting on International Beaver Day, April 7, until Earth Day, April 22, the Roots x NCC Collection will be available in select Roots stores across Canada, online at www.roots.com/NCC, as well as at Roots partner-operated stores in Taiwan and Hong Kong, with profits being donated to the Nature Conservancy of Canada to help support wildlife habitat conservation. "The beaver is a powerful success story highlighting that conservation works, and our actions to protect wildlife today will benefit Canada and Canadians in the future," said Dan Kraus, Senior Conservation Biologist, NCC. "Nature is an important part of our national identity, and we're proud to be partnering with Roots to conserve Canada's wildlife." 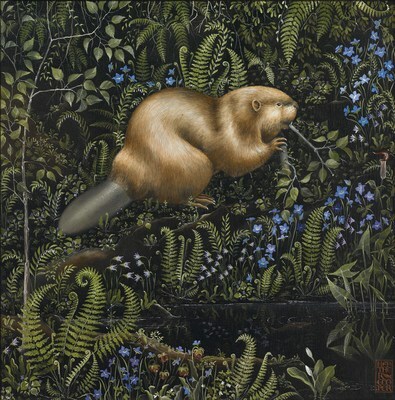 Famed Canadian artist and long-time friend of Roots, Cooper is a nature-inspired artist, well-known for her intricate paintings of the natural world. Recently featured in Greg Durrell's Design Canada, a documentary film celebrating the golden era of Canadian graphic design, Cooper discusses the inspiration behind, and the design process involved in, the Roots logo. To watch, click here. The feature-length documentary film, Design Canada, is available to rent or purchase on iTunes. Established in 1973, Roots is a premium outdoor lifestyle brand. We unite the best of cabin and city through unmistakable style built with uncompromising comfort and quality. We offer a broad range of products that embody a comfortable cabin-meets-city style including: women's and men's apparel, leather goods, footwear, accessories and kids, toddler and baby apparel. Starting from a little cabin in Algonquin Park, Canada, Roots has grown to become a global brand. As of February 2, 2019, we had 114 stores in Canada, seven in the United States, 117 partner-operated stores in Taiwan, 37 partner-operated stores in China, and a global eCommerce platform. Roots Corporation is a Canadian corporation doing business as "Roots" and "Roots Canada".